Leveraging the cloud for the agility and scalability today’s businesses demand has become the norm for most organizations. Microsoft Office 365 is a frequent choice for a businesses’ first cloud-based application. But what’s it really like once the decision is made to move to Office 365? 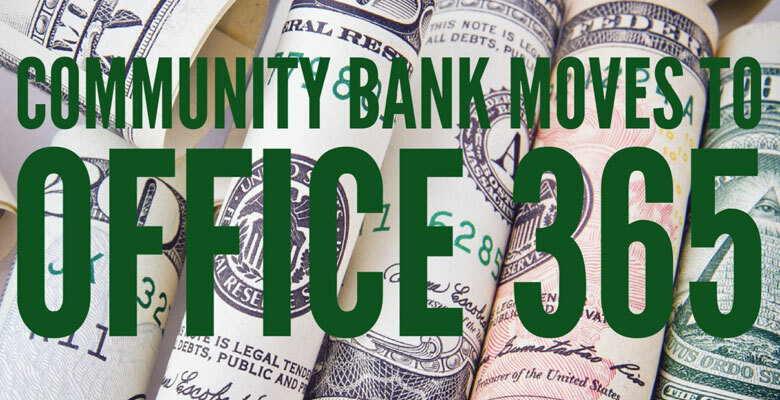 In this blog, Daymark Cloud Consultant, Steve Caprio, shares his experience of deploying Office 365 at a Massachusetts community bank with over a dozen branch locations. This was the bank’s first enterprise cloud application and Steve offers a candid view of the migration’s motivation, key security and compliance challenges, buy-in from senior management, end user experiences, and more. Q. What prompted the bank to move to Office 365? A, The bank was unhappy with their current hosted email provider. The provider was slow to respond to technical issues and much of the day-to-day configuration changes (e.g. addition of aliases or change in permissions to other mailboxes) had to be made through them or through a complicated dashboard. The provider’s lack of responsiveness reflected poorly on the bank’s IT organization as the perception of end users was that IT was the problem. Q. Were there other drivers prompting the bank to move to Office 365? A. Yes. This was a strategic move to the cloud to allow for greater agility as the bank continues to grow. Given the bank’s pain points with their existing provider, Office 365 was a good fit for their first cloud deployment. Q. Was there any resistance or hesitancy by employees or senior management? A. As this was the Bank’s first major cloud deployment, there was some initial uneasiness but given that their strategic direction was to begin migrating workloads to the cloud, there was complete buy-in from management. The majority of users were also on board with the change if it meant a more responsive IT department. Q. What were some of the key migration challenges? How were they solved? The first was the ability to gain access to the existing email system for migration purposes. Due to the hosted solution’s security requirements we were not given administrative access directly. Without the proper administrative access or control over the Exchange environment, a Hybrid migration to Office365 was not feasible. This is standard procedure for a hosted provider of Exchange as many times servers are being used by multiple customers, giving admin access to one likely means others. For this reason, we had to leverage a tool called MigrationWiz from BitTitan and perform a cutover migration of the Bank’s 300+ users all at once. The tool only required the current hosted provider to grant permissions to read and copy data belonging to the bank’s users, groups, and shared mailboxes on the Exchange server and then we were able to perform the cutover. This situation required us to make the planning, configuration, and day of cutover support completely comprehensive in order to ensure a successful project and limited end user disruption. Given the bank’s stringent security and compliance requirements, we also deployed Mimecast as an email security and continuity solution. Mimecast provides enhanced email security features including high performance spam and malware filtering, attachment protection, and URL rewrites. Simultaneously deploying Mimecast with the Office 365 applications made for a lot of moving parts. Project management was key. Q. Were there any surprises during this migration? Mimecast was configured to filter emails both inbound and outbound. It immediately improved the rate at which suspicious emails were held or blocked. The problem, which is not uncommon, is that it will catch some legitimate mail in the process. However, as we dug deeper into each unique situation we discovered that the issues being uncovered were actually from the external email sender’s security flaws. Essentially, Mimecast was helping other external companies remediate their email security flaws. There were many times when users or shared mailboxes had to be added to the scope of the project on the fly. Q. What role did compliance concerns play and how were they addressed? A. Security and compliance are always top priorities for financial institutions. Mimecast and some of the native Office 365 features were leveraged to address those needs. DLP and Rights Management were enabled in Office 365 to prevent the loss of sensitive data and Mimecast was used for encryption and journaling of data. The solution we deployed goes above and beyond the bank’s previous compliance capabilities. Q. What’s the outcome today? A. The bank’s headquarters and all branches are now fully operational on Office 365 with Mimecast. Their IT staff now has full control of the day-to-day tasks, but is also leveraging Daymark's managed services. Daymark handles licensing, new user configurations, and escalated technical troubleshooting for issues with either Mimecast or Office 365. Q. What are the next steps with Office 365? Are they wanting to do more? A. This project was a huge success, providing the flexibility the business needed while ensuring data security and compliance. It also enabled IT to restore its reputation as responsive to its users. Next steps will focus on secure mobility. Daymark will be conducting a proof of concept for mobile device management and further deployment of policies for Rights Management. If you’re thinking about an Office 365 migration, we can help. Daymark is a Microsoft Tier 1 Cloud Solution Provider (CSP), offering technical support and 24/7 managed services for Microsoft Azure and Office 365. We have also achieved Microsoft Gold Cloud Platform competency. Contact us if you want to learn how we can help you make a smooth transition to the cloud.